The new TomTom GO Mobile app is a sleek combination of the latest TomTom car navigation technology and world-class traffic information. You will always have access to the best route available based on accurate, real-time traffic information that gets you to your destination faster, every day. >> Offline navigation you can rely on: No need for an internet connection to plan your route. >> Drive more relaxed with safety camera alerts: Join our community of millions of drivers sharing safety camera locations in real-time*. 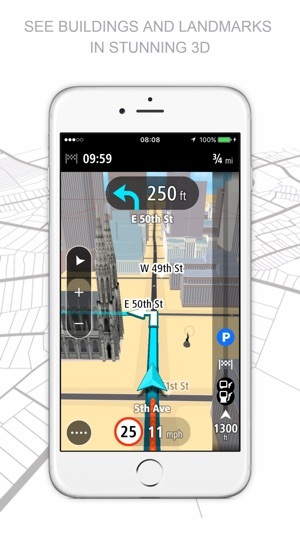 >> See buildings and landmarks in stunning 3D: Know exactly where you are so you never miss a turn. 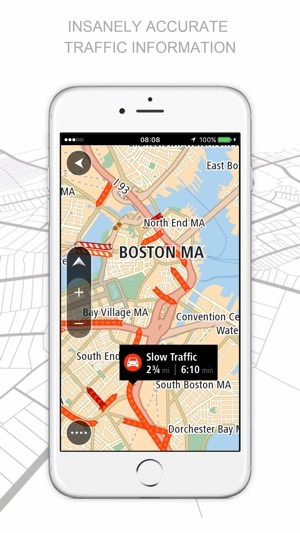 >> Quick access to your favorites: Start driving to your favorite places with a single tap on the map. Download TomTom GO Mobile and drive with the app for a fixed number of free miles every month. 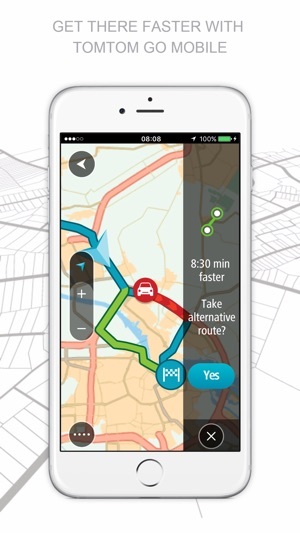 Upgrade to Unlimited Navigation to drive without miles restriction. Select a one-year or three-year subscription, depending on your driving needs. - Safety Cameras: Drive more relaxed with safety camera alerts, trusted by millions of TomTom GPS drivers. - Offline Maps: Maps are stored on your device so you don't need internet access or data roaming to plan a route. - Points of Interest: From gas stations to hotels, your app comes pre-loaded with millions of useful POIs. - Navigate to Contacts: Never memorize an address again. Select a contact from your list and the app will plan your route. 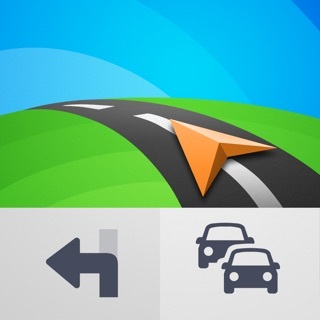 - Quick search: Find destinations faster with Quick Search. It starts finding locations as soon as you start typing. - Navigate to Copied Addresses: Easily select locations you found on websites or other apps by copying their address and pasting them into Quick Search. - Advanced Lane Guidance: Clearly see which lane to take at key junctions. ** Data storage constraints may apply. Download 4 or more full updates of any installed map per year. 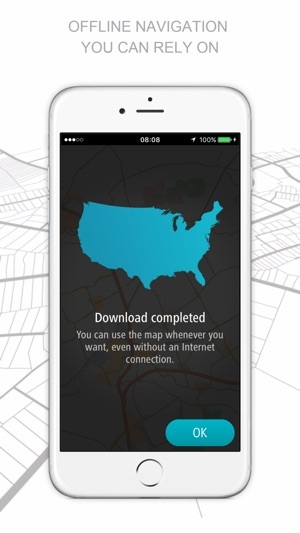 You need a Wi-Fi or cellular data connection to download new maps and updates. I’ve always loved the quality of the TomTom navigation especially the recalculation speed, however the app is just going down hill. Firstly when it finds faster routes, suddenly I can no longer see what I’m doing especially if I’m approaching an intersection and need to go the right way, the screen is filled with information and tiny touch buttons, I’m driving I cannot stare at the screen for 5 minutes reading all that, make it clear simple and without removing critical drinking information from the screen. Secondly on the latest versions the lookup from address is NOT WORKING!!! Even when I find a point on a map. Select it, navigate to it, then go to recent destinations to see what address is used and try searching for the exact same one it does not work, also it’s started adding the state twice into its addresses (street name and no)(state)(town or city)(state) why! Please fix this the address lookup used to work perfectly, I can provide many data sets for your testers to use! I tried to really like this app, thought it would be great.. It was for a short time. Traffic reporting was great. Then problems started. Support chat and email was excellent. I was told to uninstall and re install the app which I did.. Fixed for a few days. Then when I needed it for a trip, it couldn’t find the gps signal... then when it did it would not stay connected. Bottom line is I’m not paying for a subscription to an app that fails when you need it most. I would recommend looking else where. Way to many bugs for a pay as you go app. it gets worse.. I set it up for a 41/2 hr Route that I know and have used google maps for.. The route was calculated at 11hrs 40 min.. Glad I didn’t take it!! Junk don’t bother! I must be nuts but I decided to give it the old college try one more time. Huge mistake! First, i had sent in a map correction in my local area which according to Tom Tom was corrected. Guess what? took that route today... the map is still incorrect. The biggest problem of all? It will not hold a gps signal. I communicated with support twice, they tried but no good. Running the latest version 12.1.2.for iphone. If you search for this issue you will see that many iphone users have the same issue. While google maps, apple maps, have no problem this app constantly searches and looses the gps signal. I should have listened to myself. STAY AWAY FROM THIS APP!! you will be wasting your time. I am very sorry to hear about continued issues you have faced with the app, even after having contacted support. As you are having a GPS issue, this could be phone related. The other apps you have mentioned (Google Maps, Apple Maps) find your location based on cellular data, not GPS, so that's the common denominator in this instance. Bait and Switch Must Be Illegal!!! Terrible! I purchased the tom-tom app a few years ago and paid a premium price for it. I absolutely loved it and used it all the time. I ended up taking a job where I was off the road for a while, and actually got a new phone this summer. As I went to use my tom-tom app on my new phone, it no longer was supported! They are now demeaning that I buy a new version of the app and my new phone will only download a 30-day trial version of the old app that is also no longer supported. This is ridiculous! I cannot figure out how to talk to anybody at this company and this is a clear example of a bait and switch! So disappointed, and will never ever use Tom Tom again. This is absolutely unethical, and has to be illegal! Do not waste your time with Tom Tom. They will screw in the end. Thanks for sharing your experience with other users. We're sorry it's not been such a good one, and that you feel disappointed with Go Mobile. With the GO Mobile app, we wanted to make navigation more accessible to users. Using a subscription model with the new app is just one of the ways that we make this accessible - compare this to the high price that was being asked for our older apps, up to £80 just for one country or region. Go Mobile now has offline maps of the world. We offer 3 years free use of this app to users of the older Navigation app. This is because 3 years is equal to, or in some cases exceeds, the monetary value of the old app. This includes lifetime offline world maps, live traffic, speed cameras and MyDrive support. The current subscription price gives people more flexibility and also includes Lifetime World Maps (the previous app was only per country) and features like Live Traffic & Speed Cameras, which you had to pay for on top with the older app (each month!). 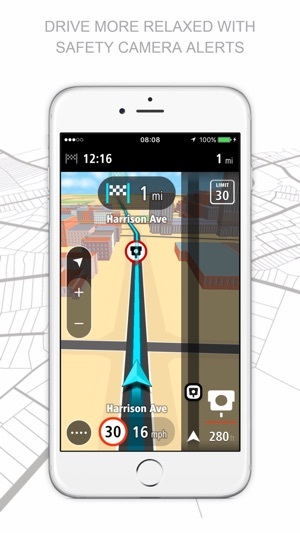 Those who download the app can also use it free of charge for 50 miles per month, giving them a 'trial' period to see if TomTom is right for them. This is a fully functional trial (including Traffic & Speed Cameras) and means that they don't have to fork out a lot of money on an app they may not enjoy using. The accessibility also extends to users of stand-alone TomTom devices. The MyDrive feature allows users to save their Routes & Places to the cloud, for access across device and different platforms. This feature was recently released in an update. The advantage of GO Mobile over other navigation apps is the fact that is uses offline maps. Other apps like Waze or Google use up your mobile data. This not only costs money but also runs a risk of the data signal cutting out in remote areas. ©2008 - 2018 TomTom International B.V. All rights reserved.